In the wake of the recent Zimmerman trial, Shan Diddy (@shannycat81) posted a tweet that was retweeted over 7,000 times, including by noted skeptic, Paul Provenza. She was recently denied a new trial after appealing to the judge to reconsider her case based on Florida's controversial "Stand Your Ground" law. The law states that the victim of a crime does not have to attempt to run for safety and can immediately retaliate in self-defense. Did the Florida court system jail Marissa Alexander for 20 years merely for firing warning shots in the air, in self-defense? Yes, she was found guilty of aggravated assault with a deadly weapon, and sentenced to 20 years prison. Yes, there was testimonial from a witness that she fired "in the air" (while inside the house). (CBS News) JACKSONVILLE, Fla. - A Florida woman who fired warning shots against her allegedly abusive husband has been sentenced to 20 years in prison. I looked into Duval County public records. Duval County is the county which Jacksonville is in. From the picture above. Judge name: Daniel James. It's the same as is credited to in the news article. Her name is the same too. The incident happened August 2010. 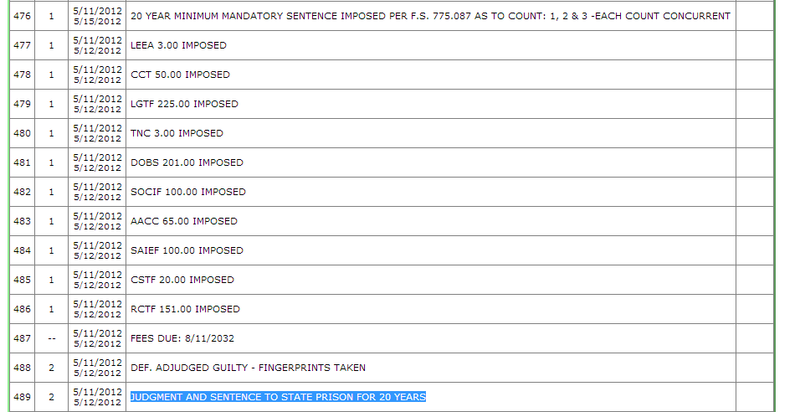 Date of her being sentenced to prison is correct too, it's 11th May 2012. And she is sentenced to 20 years. Article also state she had earlier run-ins with the law. Which also is true, according to picture below. All side data is correct. Do notice she asked for a divorce in 2011, and the name of her husband. Now onto the claim of her being sentenced 20 years to prison for firing warning shots. Aggravated Assault - Deadly weapon. A person is guilty of aggravated assault if he or she attempts to cause serious bodily injury to another or causes such injury purposely, knowingly, or recklessly under circumstances manifesting extreme indifference to the value of human life; or attempts to cause or purposely or knowingly causes bodily injury to another with a deadly weapon. An assault is carried out by a threat of bodily harm coupled with an apparent, present ability to cause the harm. It is both a crime and a tort and, therefore, may result in either criminal or civil liability. A threat of bodily harm is enough. It's enough to be considered to ATTEMPT to cause serious bodily injury, or even just use threats about it. Shooting a warning shot can easily be considered as aggravated assault. Her husband had been to court for domestic violence earlier. Florida also have the 10-20-Life law when it comes to guns. The law's name comes from three main mandatory sentences: 1) producing a firearm during the commission of certain felonies mandates at least a 10-year prison sentence; 2) firing one mandates at least a 20-year prison sentence; and 3) shooting someone mandates a minimum sentence of 25 years to life regardless of whether a victim is killed or simply injured. The second part of the question is whether she fired "in the air" in "self-defense". In the deposition, the husband several times uses the term "in the air" to describe Alexander firing away from him, while inside their home. And she shot in the air one time. And when she shot in the air, that's when I grabbed the boys and I pushed the out the door. The gun was never actually pointed at me. When she raised the gun down and raised it up, you know, the gun was never pointed at me. In this context, "in the air" just seems to mean firing up - not pointed at him or the children - rather than meaning firing into the sky. He also describes (prior to the shooting) physically and verbally threatening her, physically blocking her exit, and her getting past him, and running to the garage (where she got the gun from a car). she ran through the laundry room into the garage, but I knew she -- I didn't know she was going to get a gun but I knew that she couldn't leave out the garage because the garage door was locked, because when I came home that morning my garage door wan't working because we was having problems with the garage and it wouldn't go up, you know, it wouldn't go up. I honestly think she just didn't want me to put my hands on her anymore so she did what she feel she have to do to make sure she wouldn't get hurt, you know. You know, she did what she had to do. It might reasonably be argued that, in this statement, he is attempting to make Alexander sound innocent and diminish any criminal act she may have committed. He contradicts his previous police report (saying he was originally lying) and may not have been considered a reliable witness. Nonetheless, it seems reasonable for a newspaper reporter to use this witness testimony to describe the crime. In conclusion, any tweet is too short to contain a full context, but it is a reasonable summary of the husband testimonial as to what happened, and is accurate about the outcome - with an understanding that "in the air" is used to mean "into the ceiling". No, she has admitted under oath that she is guilty of assaulting two children and her husband with a firearm. She was originally sentenced to 20 years, but the conviction was overturned on appeal. She then pled guilty to 3 counts of aggravated assault with firearm and was sentenced to 3 years. I constantly see very disturbing things online, on television, and even posters around Jacksonville stating "Mom sentenced to 20 years for firing a warning shot....but 'nobody' was hurt". Well I might not of been hurt physically but I was hurt emotionally and mentally, so that tells me I'm a "nobody" in the mind of the public, and that puts me in more pain and and suffering then a bullet wound. Not the answer you're looking for? Browse other questions tagged united-states law guns discrimination .